I have got 3 potential leads and the search angel who is helping me says they don’t mean anything yet but to just save info for now. She says there is more to come. I have to say these photos, these stories, these lives just haunt me. I ache and feel helpless as I truly want to go back in time and help. There were some photos that just get me so upset and I feel connected. Not because they are my family, because they obviously all can’t be, but they are people with stories and in some cases extreme heart ache, abandonment and tragedy. I physically hurt as I look in the eyes of some of these people. One is a woman who died close to where I was adopted. (it’s only assumed I was born in Syracuse–nothing actually states that) and was only a year off in age. She died late 67 instead of early 67. Small differences but as we all know, non-id isn’t always accurate. Her husband seemed devoted and died years later. i tried to follow up on the kids and that is when our eyes met. The son who died not too long ago in his 50’s. His eyes at the camera laying with oxygen on all outdoorsy and gruff looking but with the most beautiful and familiar green eyes. I felt for him as I read his guestbook. He sounded like such an especially kind person. I would’ve been proud to be his sister. But it looks like all the kids are accounted for. Not sure yet. Also it bothers me that this sibling JUST died. All the time wasted if it were my sibling. The second one is the hardest one. The search was broadened a bit and to focus further back on my mother –grandmother etc. 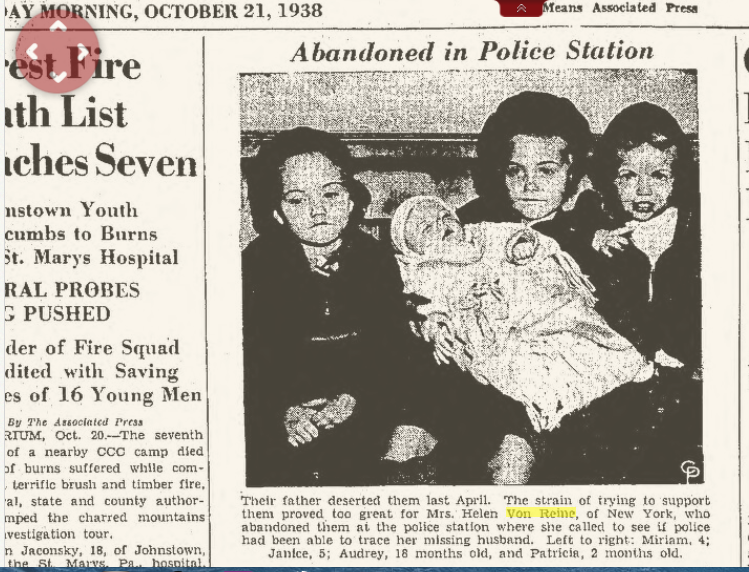 So in 1938 in Kings new york there was a newspaper photo and article. I looked into some family trees etc and found some info. Again this is not a match just something to ponder etc. The photo just killed me. These four girls could easily be part of our family. They would (could’ve) have been my mother and her siblings. This photo is so real. So urgent that I don’t care if they were relatives or not. I hurt for them, It looked like someone just drew perfect frowns on their sweet faces. The one girl, Miriam did die in 1967 at my mother’s age. Means nothing for my search right now. But those photos haunt me. A mother went to a police station to check on her husband’s missing persons report. He had been gone for a year. She excused herself to go to the restroom and didn’t come back. They sent the 4 and 5 year old to one place and put the 18 month old and 2 month old in the hospital. The maternal grandmother did go get them when she heard and later the mother turned herself in and went to the hospital. But that photo! It was a black and white photo and not that clear. But sharp enough to feel the desperate fear. I felt as if a certain fear, a certain trauma, a loss of trust can not just effect you but be passed through generations. There is just something so unsettling to certain incidents. When time stands still. I must be a weirdo because other people just don’t seem to go through these delays. I’m supposed to be picking out info and facts, but instead I imagine these are my families and I hurt for them. I’m supposed to just move on with it so to speak. But I stop and mourn things that probably aren’t mine to mourn. I hope the girls grew up to find happiness. The third one is a woman in Florida. Her husband’s surname is still there. There is a small write up on the mother but lots more on the father and his side of the family. She was born at the right time and died in early 1967. No cause of death that I could find, but it was after a hospital stay. (Hospital stay could equal sepsis after a child birth) There was little on her people and they were older. Her husband died in 1976. There was a picture of her that looked like there was a pregnant belly. She was on a swing. She didn’t look to be buried with him. She had a child that had died at the age of 15 of huffing. They called it “sniffing”. She had 3 other kids not even listed on her memorial page but shows on her husbands page where she is mentioned as spouse. If I find out this woman is my mother there will be a lot more than slight mention. A lot more flowers. A lot more feeling. It just seems this woman was forgotten and not as notable as her husband. I just felt for her. 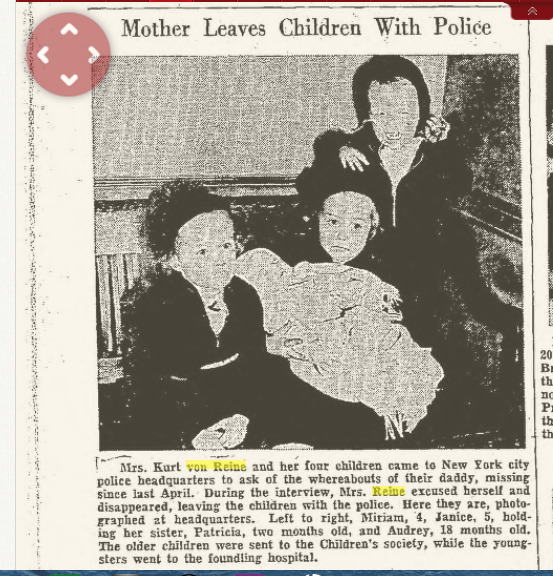 If this was my mother I’d say the four older siblings were kept and know their names and history. I don’t know yet. But it does make me think that if my story is something like this then DNA may never help as her people are dead and any siblings don’t deal in missing relatives. His people wouldn’t care another words. Or don’t even know somehow. There are some facts in her story that echo in my story as well. She was effected by some of the same things I have been. I mailed my kit off. I hope something comes of it. I haven’t seen anything on social media and the online registries seem hopeless. Especially the ones that show someone looking for a sibling but in a different state. Like where the lawyer that handled my adoption (or advised my a parents in) was from and later retired to and died. Some of these registries you have to inquire instead of comment so you get an email back –No match because they won’t look outside the box. To me it’s like this. You’ve been looking 30 years and so have other siblings–the dates are within range–then Why Not? It’s more than possible since NY and FL and two other states are notorious for sharing adoptees. But no go. If states would just open sealed records there wouldn’t be all this wasted time. Does anyone else get lost in stories/lives like this? There little eyes and their little frowns. These things just haunt me. I wish I could go back in time and help.